I think I’m liking this arc a lot more than I expected? For a long time this series was just ok for me. I was reading it as it came out but I wasn’t really looking forward to new issues much. Gillen taking over the series made it better but it still wasn’t my favorite series. With this being a breather arc, I didn’t really expect to enjoy it that much. I didn’t think it’d be bad but I also didn’t expect to especially like it. The story continues from the previous two issues. The crew is stranded on the moon of Hubin after an encounter with Imperials forces Sana to abandon them. They find allies in the Markona family, who seem to be hiding things from them. This issue was very character-focused, which is something I really enjoy. Luke and Tula’s relationship feels just a little bit underdeveloped but it was still interesting. It was nice to see Luke training with his lightsaber, Gillen has focused much less on Luke’s Jedi training than Aaron did thus far. 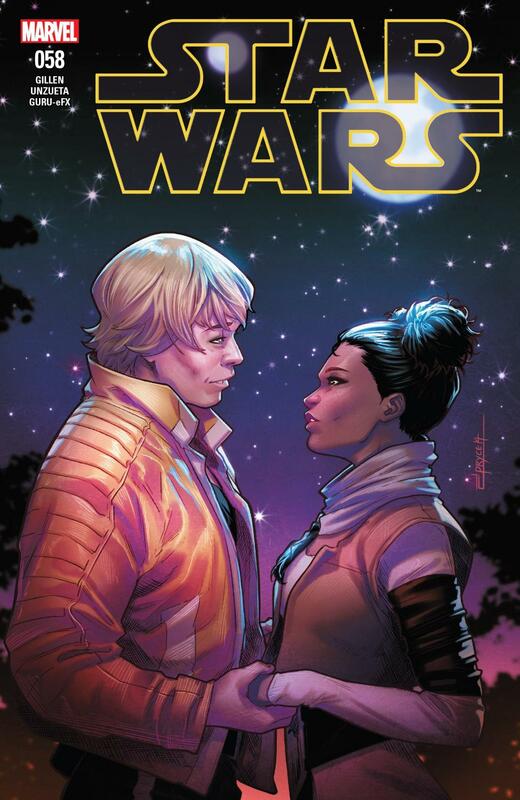 Han and Leia’s parts were my favorite in the issue. One cool thing this series can do is tie the original trilogy into the more recent movies, so far we’ve seen this in ties to Rogue One (primarily Luke learning about that team’s sacrifice, culminating in the naming of Rogue Squadron). We get to see that again in this issue through Han telling Leia about his backstory from his solo movie earlier this year, in a scene that I thought was especially good. Angel Unzueta continues to do the art for the arc, having started with it last issue. I like his art overall, the action feels kinetic, the backgrounds are great, the only thing that isn’t great are some of his faces. It’s the same problem that Salvador Larocca had during his long run on the series before, though I don’t think it’s nearly as bad. Looks like Unzueta will be splitting the series, or at least this arc, with Andrea Broccardo, whose art I also think is pretty good, so I’m finally happy with the art in the series overall. It’s pretty clear where the rest of the arc is going to go from the solicitations and I’m looking forward to seeing it play out. I’m happy that we got this arc as a breather between two big important arcs. Hope Dies was interesting because it was such a big event in the timeline but I’m surprised to find that I’m enjoying this arc more. This is probably the most I’ve enjoyed the series since Aaron’s second arc, and if the rest of the arc goes well it could become my favorite. Can’t wait to see where it goes next!